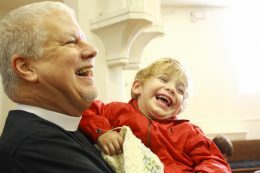 All Saints Episcopal Church in El Paso, Texas is announcing the arrival of The Rev. Philip W. Dougharty as Rector effective June 1. Fr. Phil, as he is called, arrives from Albuquerque, NM where he has lived since 2012. Fr. Phil graduated from Union Theological Seminary in 1995 and was ordained to the Priesthood in 2001 in the Diocese of Newark, NJ. He served at Trinity and St. Philip’s Cathedral as Assisting Priest until he was named Rector of St. John’s Grace Episcopal Church in Buffalo, NY where he served until 2012. While in New York, Fr. Phil also worked for the Faith and Values Channel and Production Company for 10 years. Phil graduated from Gadsden High School in Anthony, NM in 1968 before attending Oklahoma Baptist University in Shawnee, OK. He returned to Albuquerque and received a Master’s in Music (Choral Conducting) in 1984, He also taught music and theatre arts in Albuquerque Public Schools and was Program Director for KHFM Classical Radio for several years.